The latest endeavour from Hong Kong-based architect Andre Fu is a two-level contemporary Japanese restaurant sporting a mezzanine level dedicated to a hip sake bar. Keeping with Japanese tradition, the entrance - an elegant hallway lined with bamboo posts – is an understated affair inspired by the elegant bamboo torii (gates) at an ancient Kyoto shrine. It leads to the first statement dining space featuring a pristine 11-meter-long sushi counter carved out of solid pine. 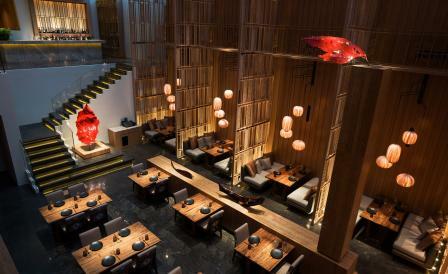 Here, diners are treated to dramatic views over the cavernous main dining-room where Fu has created what he calls a ‘modernist bamboo theatre’ with a series of intimate booths separated by distinctly modern, tall bamboo screens, softly lit with custom-design silk pendants. The designer’s inimitable appreciation for subdued colour is also on show here, with sumptuous mud orange and cool mineral greys that beautifully complement the natural materials such as bamboo, sand and volcanic charcoal stone. Meanwhile, Japanese lacquer artist Muramoko Shingo’s ethereal installation of suspended red lacquer maple leaves adds a dreamlike quality as they seemingly ‘float’ through the three distinct spaces. The food is as good as the setting: in the kitchen, the acclaimed Chef Sawada Kazumi serves up exceptional sushi and contemporary Japanese seasonal fare but we think the Instagram-ready sake bar is worth a visit alone for its excellent selection of rice wines.